What makes an hour-long TSA line even worse? Slow airport Wi-Fi. Aside from lost luggage and long TSA lines, slow Wi-Fi can be one of the most frustrating things while traveling. Speedtest has discovered the top airports in North America with the fastest and slowest internet speeds. Using data from March to May 2017, Speedtest examined airport-sponsored Wi-Fi at 30 airports across the continent. Denver takes the cake as the airport with the fastest Wi-Fi, while Vancouver and Philadelphia follow closely behind. Each airport is rated on its download and upload agility, and the data found that for a majority of the time, uploading seems to be much quicker than downloading except for in Denver. At Denver, travelers can download and upload with little trouble -- in fact, this airport has the fastest Wi-Fi on the planet, according to Speedtest. It even got a 27 percent boost since the firm last tested it in January. If you’re traveling through Montreal, Atlanta or Toronto, don’t expect to get any work done -- these airports came in last and have some of the slowest Wi-Fi speeds of all 30 travel hubs. 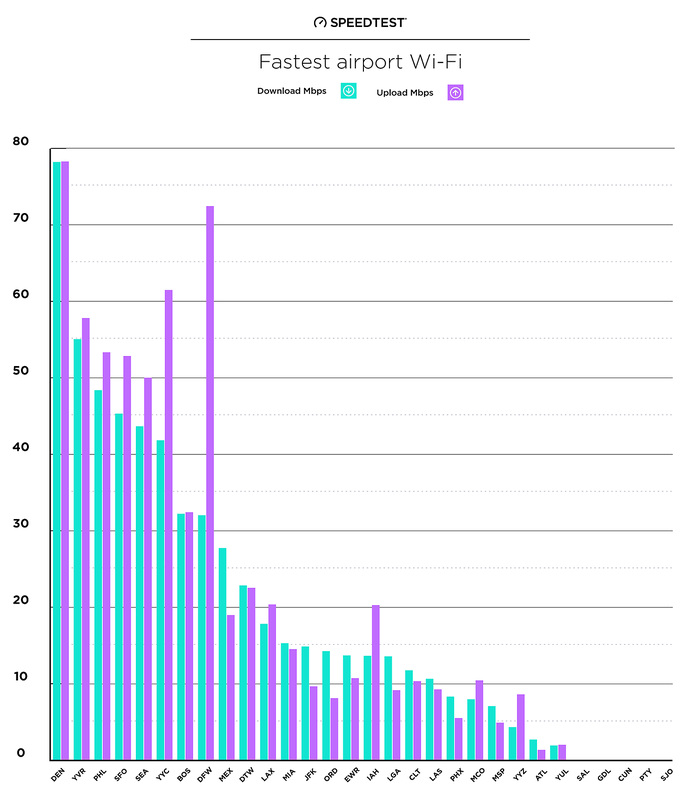 Overall, though, you’ll be happy to know that internet speeds are getting faster every day -- even at airports. But don’t leave it up to luck. Instead, check out these airports with the fastest and slowest Wi-Fi service in the U.S., Canada, Mexico and Central America. *The numbers exclude airports that do not have existing Wi-Fi.